Inspired by Eggslut's infamous breakfast sandwiches, this recipe calls for a special egg cooking method. This cooking method exists thanks to Vice's awesomefood channel, Munchies, and the marbleized egg was popularized by Eggslut, a super awesome – you guessed it – egg sandwich restaurant in LA. Begin by frying two slices of bacon over medium heat until crispy. Remove bacon from the pan but leave the renderings and grease. Add onions to the bacon grease and cook for a few minutes on medium-low until they become caramelized. Remove the onions and add the 2 eggs in the remaining grease. With a plastic spatula or wooden spoon, run the tip through the egg yolks and the whites so that both colors become intertwined with each other. Meanwhile, put your bagel in the toaster. Let the eggs cook for a few minutes until the whites become opaque, and the yolks are cooked through. Once the first side is cooked halfway through, gently flip the egg, turn the heat to medium-low, add the cheese, and cover – letting the egg cook through while the cheese melts. Now that all the components are prepared, it's time to build the sandwich. 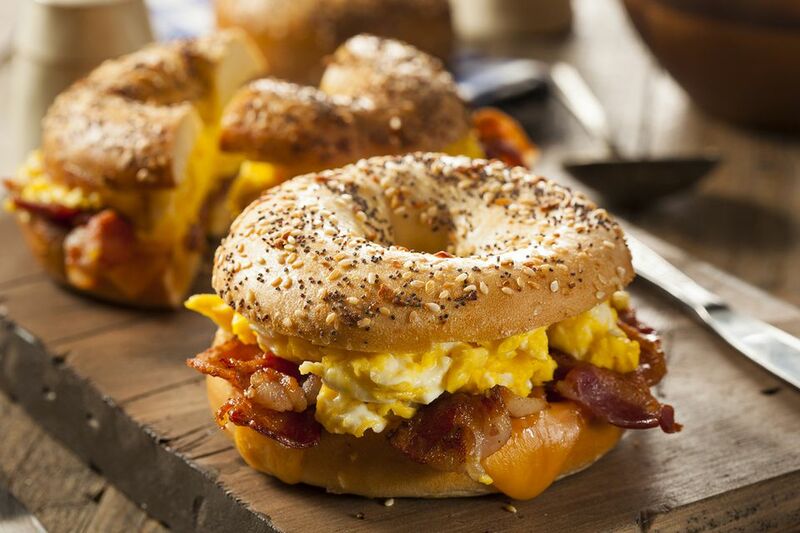 Once the bagel is toasted, add the cooked egg with the melted cheese and onions. Chop the bacon before you add it to the sandwich so that each bite is consistent. Add the other piece of the bagel and serve.